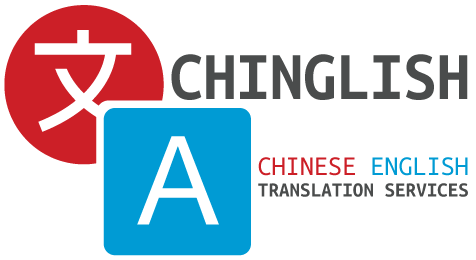 Chinglish offers premium quality English to Chinese and Chinese to English translation services. We provide our service to local and international clients from our base in Christchurch, New Zealand. Our method of translation is quite unique. We work in a team of 2 translators per document. Both translators are bilingual in English and Chinese, but one native English and one native Chinese speaker. This way we can ensure, nothing is lost in translation and everything is clearly understood when translating your documents. BUSINESS DOCUMENTS: business correspondences, proposals, product enquiries, marketing materials, reports, trade and shipping documents, financial documents, information guidelines, instruction manuals, business cards, job descriptions, contracts, patents, SOPs, newsletters, etc. TOURISM TRANSLATIONS: hotel and motel guest information, tour information, car rental guidelines, campground information, rental property profiles, adventure tourism guidelines, etc. WEBSITES: copy and text from websites in any industry. PERSONAL DOCUMENTS: letters, resumes and curricula vitae, cover letters, application letters. STAMP SERVICE: Please note, we do NOT offer a stamp service for official documents such as Immigration NZ and police certificates. 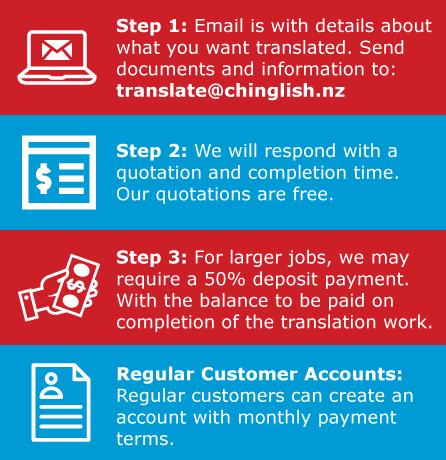 If you have content to translate and would like a quick, no obligation quote, please get in touch with us today. Include details of the required translation and the documents to be translated and we will reply with details right away.